The full text of a lengthy discussion about Kansas City artists, the importance of community, and Charlotte Street’s early mission and vision. A contextual essay and interview with Dirt Gallery’s Davin Watne and Leo Esquivel (by Hesse McGraw and Kate Hackman), which appeared in Review, Summer 2003, one month after Dirt (1997-2003) closed in the West Bottoms. 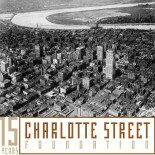 Charlotte Street history: Old UCP Pix!